In D-Day at Iwo Jima, designer Joe Youst builds on John Butterfield’s award winning solitaire game system. The player controls three US Marine divisions against a determined Japanese defense. The no-dice combat system highlights the unknown enemy deployments and coordination of the right weapon systems and tactics. Players familiar with the previous three games in the system will be able to quickly set up and play this latest version. New features include a random fortification generation system that simulates the ability of the Japanese forces to “re-fortify” supposedly weakened positions and an updated infiltration system that encourages the player to maintain a continuous line. 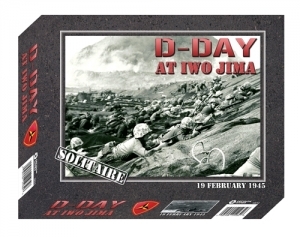 D-Day (19 February) – Covers the first day in six turns.